Vol 6 No 3 (2018): Special Issue FAÇADE 2018 – Adaptive! 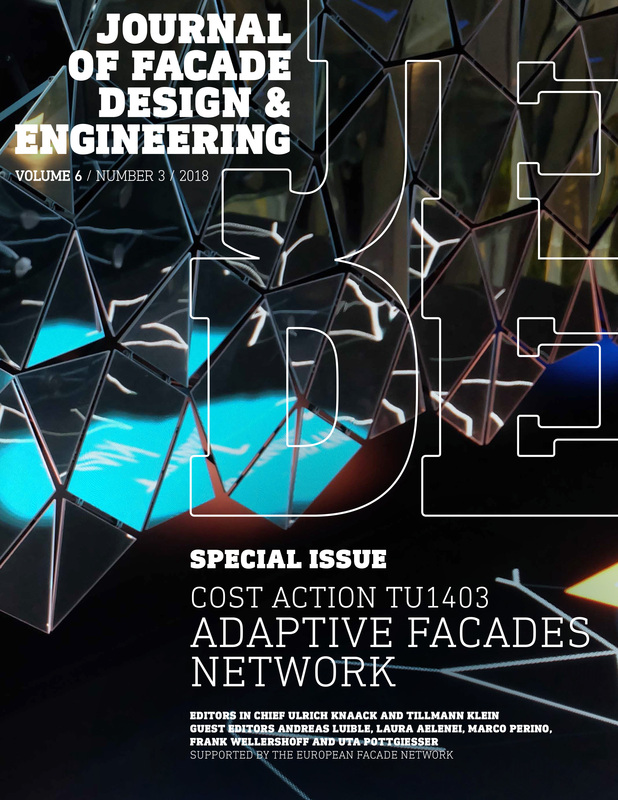 Special Issue FAÇADE 2018 – Adaptive! Cooling demands in buildings have drastically increased in the last decades and will follow that trend in the near future, due to increasing standards of life and global climate change among the most relevant factors. Besides energy consumption, the use of refrigerants in common vapor compression cooling technologies is a source of concern for their environmental impact. Hence, there is a need to decrease cooling demands in buildings while looking for alternative clean technologies to take over the remaining loads. Solar cooling systems have gained increased attention these last years, for its potential to lower indoor temperatures using renewable energy, under environmentally friendly cooling processes. Nonetheless, their potential for building integration has not been fully explored, with the exemption of scattered prototypes and concepts. This paper aims to address these knowledge gaps by presenting the results of the PhD research project ‘COOLFACADE: Architectural integration of solar technologies in the building envelope’. The research project explored the possibilities and constraints for architectural integration of solar cooling strategies in façades, in order to support the design of climate responsive architectural products for office buildings, driven by renewable energy sources. 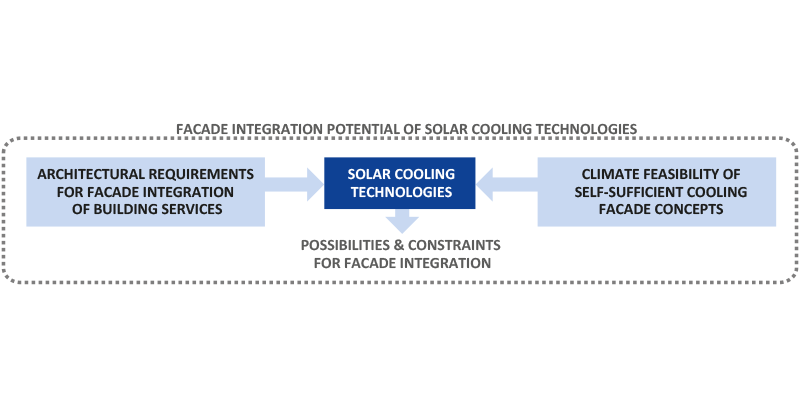 The paper explores different aspects related to façade integration and solar cooling technologies, in order to provide a comprehensive understanding of current possibilities for façade integration; while drafting recommendations based on identified barriers and bottlenecks at different levels. Today’s society needs to face challenging targets relating to environment and energy efficiency, and therefore the development of efficient façade systems is essential. 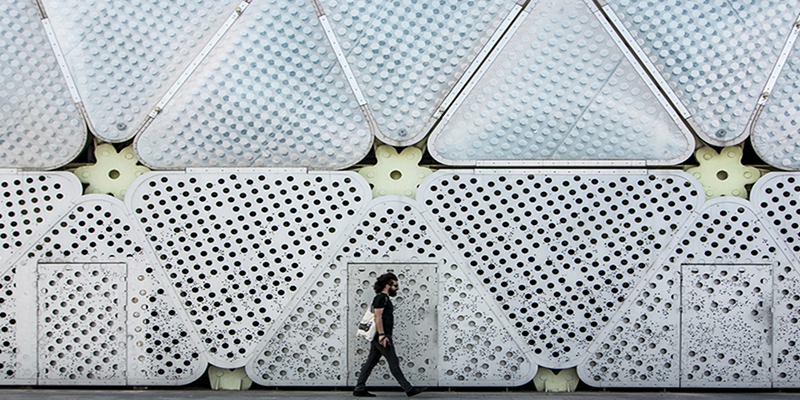 Innovative concepts such as Adaptive Building Façades might play a role in the near future, as their dynamic behaviour could optimise the performance of a building. 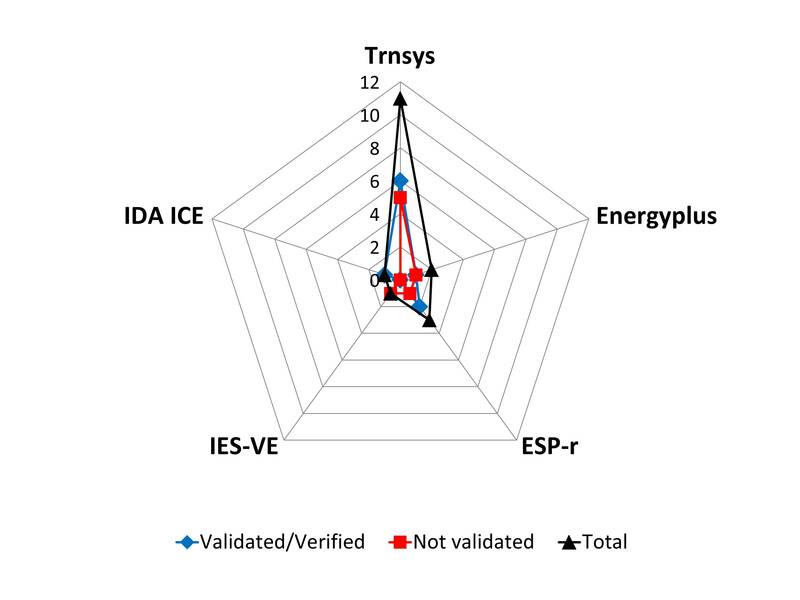 For their successful development, a balance between sophistication and benefit is necessary and the implementation of Smart and Multifunctional Materials in building envelopes could be the key, as they have the ability to repeatedly and reversibly change some of their functions, features, or behaviours over time in response to environmental conditions. However, these materials were predominantly developed for use in other fields, and there is a lack of specific technical information to evaluate their usefulness in façade engineering. The aim of this paper is to collect the critical information about promising responsive materials for use in the design of Adaptive Façades, in order to help designers and technicians in decision-making processes and to scope possible future applications in façades. Investigated materials were analysed from the Building Science standpoint; their weaknesses and threats in the built environment were highlighted, and their technical feasibility was examined through the study of their availability in the current market. Ventilated façades are applied in both new and existing buildings. 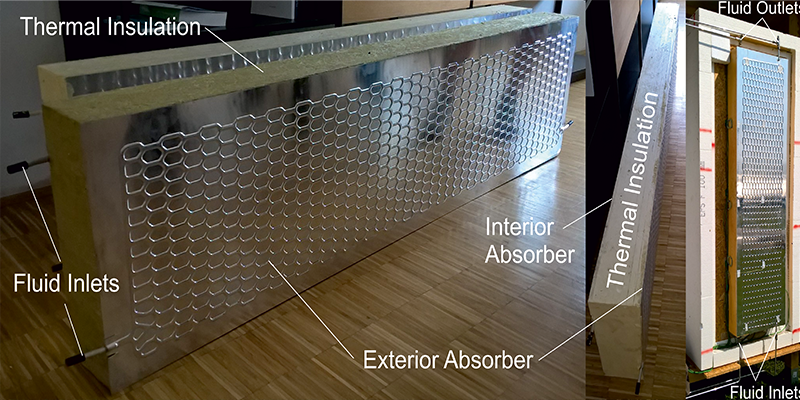 It has been claimed that these components help to reduce energy use in buildings and improve occupant comfort. However, their performance strongly depends on the airflow passing through the cavity. In order to characterise and to model the behaviour of the ventilation and its effectiveness, the components need to be tested in the laboratory, as well as under real dynamic weather conditions. Despite the steadily growing research in this area, there are few studies with conclusive results about the reliability of existing experimental procedures for characterisation of airflow in the ventilated cavities. The aim of this paper is to describe and review recent state of the art experimental assessments for the airflow characterisation in ventilated cavities. The paper starts with a short introduction on the potentialities and limitations of different experimental methodologies, and continues with a detailed classification and description of the most relevant monitoring techniques for airflow in air cavities of façades that have been developed in recent years. basic assumptions of 1D assemblies, a critical discussion of experimental-to-numerical comparisons is then proposed for a selection of specimens. Adaptive façades can improve the building’s energy efficiency and economics, through their capability to change their behaviour in real time according to indoor-outdoor parameters, by means of materials, components, and systems. Therefore, adaptive façades can make a significant and viable contribution to meeting the EU´s 2020 targets. Several different types of adaptive façade concepts have already been developed, and an increase in emerging, innovative solutions is expected in the near future. According to recent research, the word ‘adaptive’ in the context of building façades is often associated in the literature with a long list of similar words. Moreover, there is no consistent definition of façade adaptability, although studies exist in relation to characterisation issues, design parameter, and classification. Even within the discipline of architecture and engineering, words such as ‘smart’, ‘intelligent’, ‘interactive’, ‘adaptive’, or ‘responsive’ have been used loosely and interchangeably, creating confusion as to their specific meaning and their conceptual relationship to building performance and design. In response to this, the goal of this paper is to build a provisional lexicon, or descriptive, behavioural, and methodological words, to assist researchers and designers in navigating the field of high-performance façades that incorporate materially innovative and feedback-based systems. It offers a brief overview of current advances in this nascent and rapidly evolving field and articulates a broader conceptual territory for the word ‘adaptive’, used in many cases to describe the technological systems that interact with the environment and the user by reacting to external influences and adapting their behaviour and functionality. The objective of this paper is to contribute to these developments by presenting the findings. Furthermore, common definitions will be proposed, based on the characterisation design parameters, classification approaches, and real case studies. Although their potential for high environmental performance is largely accepted, adaptive façades have not yet become widespread in practice. Most of the current examples are developed by engineer-to-order design processes, as project-oriented, custom, and complex solutions. More simple and reliable solutions are needed to support the reuse of technical solutions between projects and increase the feasibility of adaptive façades. Therefore, this research aims to develop a procedure to design adaptive façades whose parts are based on engineered standard products with the least number of parts and layers. The research is initiated through the generation of concepts for designing adaptive façades to be manufactured using standard products. From several concepts, ‘redesigning dynamic adaptive façades’ has been selected for further investigation, as it pursues the goals for a solution determined for this research. A preliminary case study is conducted to redesign an adaptive façade to be manufactured with standard products. Its process steps are captured and analysed, and the steps that need improvement are revealed. To systematise and improve the captured redesign process, façade design and product design methodologies are analysed in the context of adaptive façade design. Redesign and reverse engineering processes used in product design are adapted and merged with façade and adaptive façade design processes, and a 5-phase adaptive façade redesign procedure is outlined. Each phase is developed based on mature tools and methods used in product and façade design. An iterative loop of development, application test, and review process is carried out for development of the process steps. Thus, a redesign procedure is generated by the combined application of DFMA and TRIZ in the synthesis of reverse engineering and redesign processes. Consequently, the application of the redesign procedure is demonstrated through a case study. The case study revealed that the procedure has the ability to generate a façade redesign that has a higher constructability index than the reference façade. This article presents an overview of possibilities and points of attention for modelling the performance of dynamic CFS in building performance simulation software. Following a detailed analysis of the unique requirements that are associated with modelling of CFS, a comparative study of the capabilities in different software implementations is presented. In addition, we present on overview of state-of-the-art approaches to obtain the necessary Bi-directional Scattering Distribution Functions (BSDF), involving experimental characterisation, databases, and component-level ray-tracing approaches. The second part of the paper provides a detailed discussion of a case study of a high reflective lamella system. This case study complements the review with hands-on information from a practical example and highlights the importance of developing models at the right level of complexity, taking into account the type of questions that the simulation intends to answer and the required accuracy level to do so. Conventional sandwich panels are one of the cheapest and easiest solutions for forming the thermal building envelope of industrial buildings. 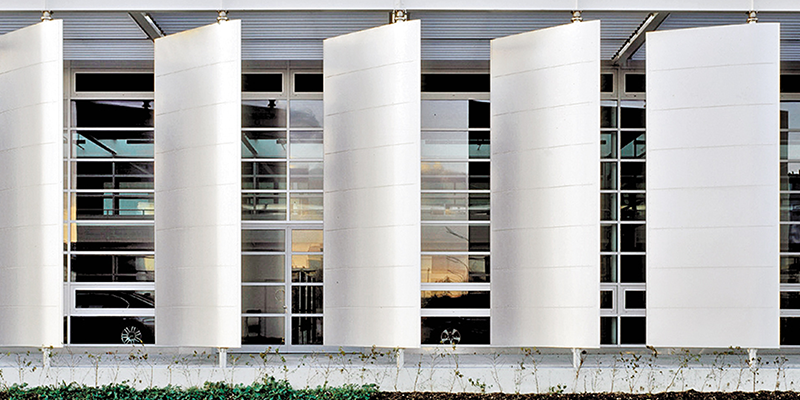 They are pre-fabricated façade elements, of which millions of square metres have been produced and mounted every year. There is great potential to reduce the consumption of fossil fuels and CO2 emissions through the solar thermal activation of such a sandwich panel. In the course of the research project ABS-Network SIAT 125, a Solar Thermal Activated Façade (STAF) panel was designed which is to be optimised both thermally and structurally. 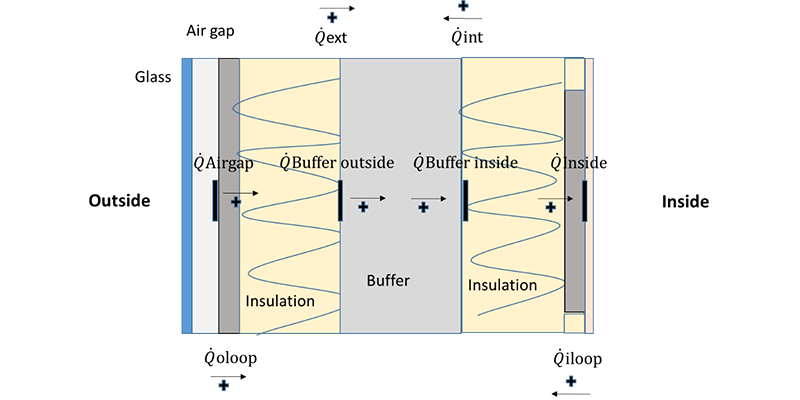 This study shows a first version of a so-called ‘one way coupled’ thermal and structural analysis of a conventional sandwich panel compared to the STAF panel. For this purpose, the numerical methods of Computational Fluid Dynamics (CFD) and Finite Element Method (FEM) are used together in one simulation environment. Furthermore, results from an outdoor test facility are presented where a first version of a STAF panel is tested under real climate conditions. The CFD model was positively evaluated by comparing measured and computed temperatures. development in the successful use of BES to replicate the thermal and optical behaviour of opaque and transparent components integrating PCMs, in order to provide the community of professionals with an overview of the tools available and their limitations. The paper presents the first results of research that was partly conducted within the framework of European COST Action TU1403 – Adaptive Façades Network, on the development of an adaptive BIPV (Building Integrated Photovoltaic) solution able to change its curvature in relation to the external environmental conditions, orientating itself in order to optimise the energy production without the aid of any mechanical and electrical systems. 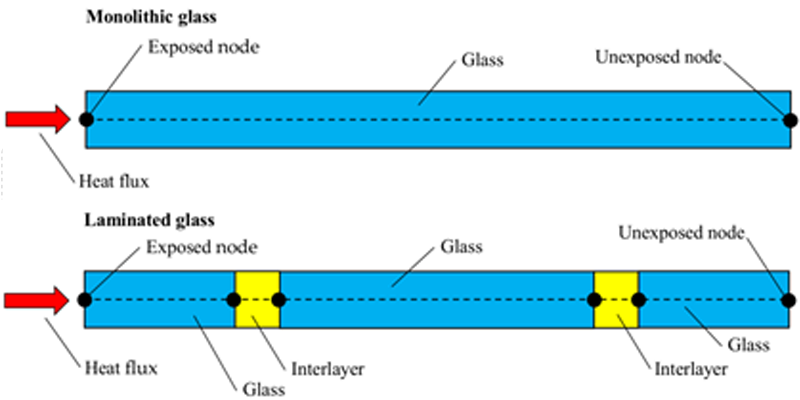 After analysing the characteristics of the main adaptive materials that are currently used for such applications, the contribution outlines the main features of the proposed system, which consists of thin film solar cells coupled with a thin layer of hygromorphic material, manufactured from two wooden slats joined together and produced from different types of wood and trunk cuts. 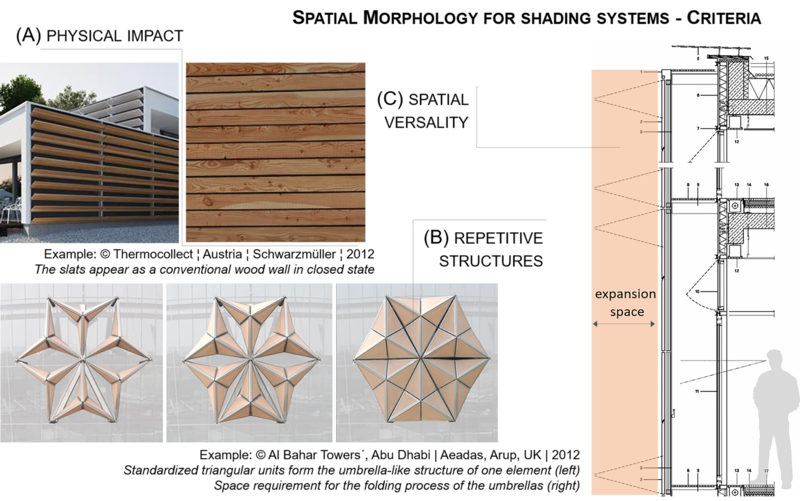 The hygromorphic layer thus obtained can change its shape as a function of temperature and relative humidity of outdoor conditions, thanks to the different expansion coefficients of the two wooden slats. To evaluate the performance of the component, three shape configurations for the adaptive strips have been assumed. For each hypothesis, the lamellae have been modelled using the Rhinoceros 5 Software, according to the curvatures taken during the different months of the year. 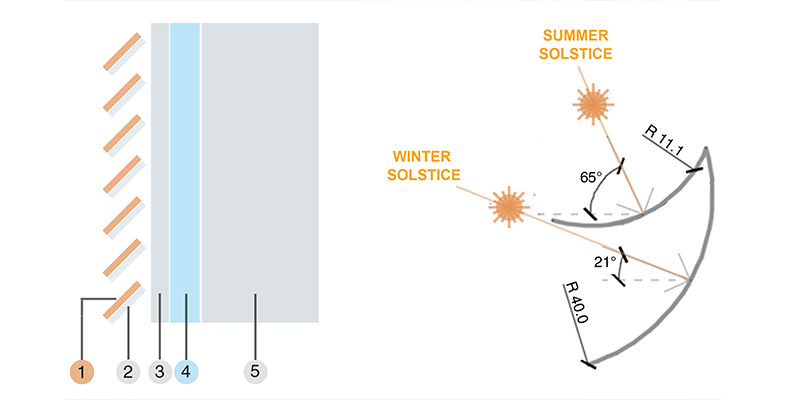 The Rhino models have been imported into Autodesk Ecotect Analysis to calculate the incident solar radiation and to study the self-shadowing effect in the various configurations (in relation to the climatic conditions of the city of Milan). The paper outlines the system and PV energy production optimisation process, as well as possible applications in the field of façade design. Post-occupancy evaluation is a valuable method of generating information on the performance of adaptive building façades in relation to users. This evaluation technique involves both procedural methods, such as soft-landing, and empirical measuring, such as environmental monitoring or self-reporting techniques including surveys. Several studies have been carried out in recent decades to identify the most appropriate methods for occupant comfort, well-being, productivity, satisfaction, and health assessments in workplaces. Post-occupancy evaluation of adaptive façades can, however, be a challenging task and information on this topic is still scarce and fragmented. The main contribution of this paper is to bring together and classify the post-occupancy evaluation methods for adaptive façades and suggest a framework for their holistic evaluation. Specific recommendations for improving current standards and guidelines are outlined here to enhance occupant satisfaction and environmental conditions in workplaces for future design projects. Finally, we discuss various ongoing trends and research requirements in this field. 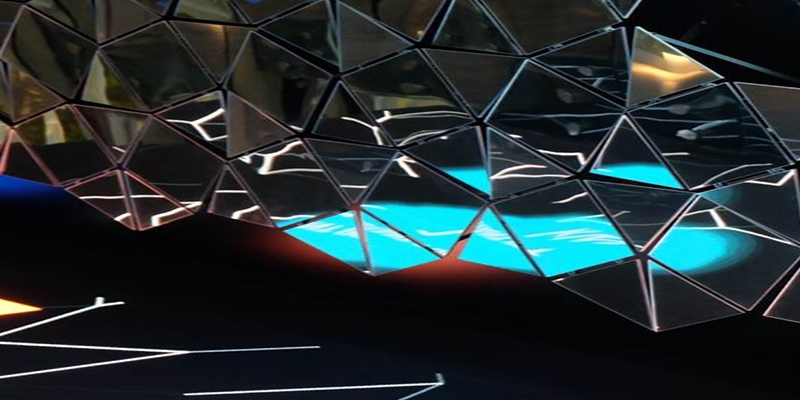 This special issue is linked to the conference FAÇADE 2018 – Adaptive!, the fifth conference that is organised by Lucerne University of Applied Science and Arts within the framework of the European Façade Network EFN. FAÇADE 2018 is also the final conference of the COST Action TU1403 “Adaptive facades network” (www.tu1403.eu) and dedicated to multifunctional, adaptive and dynamic building envelopes. In order to advance the development and application of adaptive facades COST Action TU1403 “Adaptive facades network” was initiated in 2014. The COST Action, which started in 2015 and ends by the end of 2018 is a European research project with the objective to support trans-national cooperation between researchers and industry through science and technology networks. Over four years, more than 210 participants from 27 countries were involved in numerous COST networking activities: 15 meetings, two training schools, two industry workshops, 31 short term scientific missions and two conferences.